We use Royal Mail for the vast majority of our orders. Larger orders are shipped via courier. Mail out days are every Wednesday and Friday. PLEASE NOTE: Shipping charges are already included with the Paypal button. All orders placed on this site will be sent direct to Paypal's secure site. You can also view your shopping cart at any time via the button on the top right of your screen. PLEASE NOTE: You do not have to be a registered with Paypal to use their services. It is possible to check out as a guest AND use your credit card if you wish. Cheques should be made payable to Tangerine Press in £Sterling only please and sent to the address below. If you wish to place an order via BACS (UK only) or IBAN (everywhere else), please email us with your order and we will send over an invoice with all details. We do not recommend sending cash through the mail, but you are welcome to try. If you decide to do this, please make sure it is £Sterling only, well concealed and send to the address below. All books are shipped first class to any location across Great Britain and Northern Ireland. The very limited editions of titles (ie. 26-copy and 50-copy) are sent first class registered. Larger orders are shipped via courier and are usually next day delivery. This includes all countries in Europe, not just those in the European Union. Orders are sent out airmail 'printed paper' or via courier for larger orders. The very limited editions of titles (ie. 26-copy and 50-copy) are sent trackable or trackable/signed, depending on the destination country. This is the option to choose for all countries outside the UK and mainland Europe (ie. this includes USA, Canada, Australia, New Zealand, etc). Orders are sent out airmail 'printed paper' or via courier for larger orders. The very limited editions of titles (ie. 26-copy and 50-copy) are sent trackable or trackable/signed, depending on the destination country. 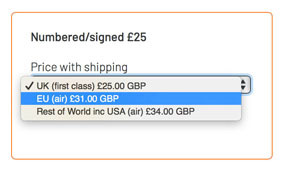 Please be sure to choose your correct shipping zone from the dropdown box, just below the Paypal button. Not choosing the right option will lead to delays in processing your order, so please choose carefully! Shipping is already included with the Paypal button. The dropdown box will give you the total amount for each book. All hardcover books are sent out in high quality self-sealing bookpacs and sturdy mailing boxes. Paperbacks are sent out in stiff card mailers. Larger orders are sent in appropriate box sizes with plenty of protective padding. In the case of handbound, limited editions, we package with extra corner protection and wrap securely with bubblewrap. These act as a guideline, but we find them to be accurate. *Please do not hesitate to get in touch if you still have not received your book outside of the above lead times.